Europe should restructure Greece Debt: Debt Relief? The International Monetary Fund is doing the right thing by not participating in a deeply flawed loan agreement that European leaders have negotiated with Greece. Years of misguided economic policies sought by Germany and other creditors have helped to push Greece into a depression, left more than a quarter of its workers unemployed and saddled it with a debt it cannot repay. The latest European attempt to bail out Greece will make the situation even worse by requiring the country’s government to cut spending and raise taxes while increasing the country’s debt to 200 percent of its gross domestic product, from about 170 percent now. The I.M.F., which joined European countries in their first two loan programs for Greece, says it cannot lend more money because Greece’s debt has become unsustainable. In a statement on Friday, the fund’s managing director, Christine Lagarde, said Greece’s creditors had to provide “significant debt relief” to the country. Last month, the fund said creditors needed to either reduce the amount of money Greece owes or extend the maturity of that debt by up to 30 years. This is a much tougher position than the I.M.F. has taken before. In 2010, it did not insist that Greek debt be restructured. That was a big mistake because it left Greece with more debt than it had before the crisis and reduced the government’s ability to stimulate the economy. What Ms. Lagarde, a former French finance minister, says matters because European leaders like Chancellor Angela Merkel of Germany want the fund to be a part of the loan program since it has extensive expertise in dealing with financial crises. European officials have said only vaguely that they might be willing to consider debt relief. Many lawmakers and voters in other European nations oppose providing more help because they think the Greek government has failed to carry out the economic and fiscal reforms that would make the country more productive. There is no question that Prime Minister Alexis Tsipras of Greece needs to do more to raise economic growth. But even if he does everything European leaders are asking him to do — a list that includes cutting pensions, simplifying regulations, privatizing state-owned businesses — the country will still not be able to pay back the 300 billion euros it owes. Rather than go through a messy default in a few years, it is in Europe’s interest to heed the I.M.F.’s advice and restructure Greece’s debt now. Posted in Economic and Public Policy, Economics, Economy, Finance, Governance, Greece Debt Crisis, Public Accountability. The Eurozone and the International Monetary Fund have crushed the hopes of a youthful movement that sought to transform a nation and rouse a continent. Beyond the shock that events in Greece have given supporters of the European project, there are other noteworthy features. The EU is becoming increasingly authoritarian, as Germany imposes its wishes and obsessions unchecked. Though founded on a promise of peace, the EU seems incapable of drawing lessons from history, even when recent and violent; what matters most to it is sanctioning bad debtors, and the headstrong. This amnesiac authoritarianism is a challenge to those who saw the EU as the place to experiment with going beyond the framework of the nation-state, and achieving democratic renewal. “How many divisions does the pope have?” was reportedly Joseph Stalin’s dismissive response to a French leader who urged him to deal tactfully with the Vatican. The states in the Eurozone now seem to be applying the same approach to Greece; reckoning that the government they find so exasperating would be unable to defend itself, they have destabilised it through enforced bank closures and import suspensions. Relations between members of the same union, who belong to the same institutions, return representatives to the same parliament and use the same currency, should preclude such machinations. Yet the Eurozone countries, with Germany at their head, safe in the knowledge of their superiority, imposed a diktat on a weakened Greece which everyone acknowledges will worsen most of its problems. This whole episode exposes just how deep the cracks in the EU go (1). However, the success (for now) of Germany’s plan to relegate Greece to the status of a Eurozone protectorate is also the result of failed gambles by Greece’s leftwing majority, in the over-optimistic hope of changing Europe (3). 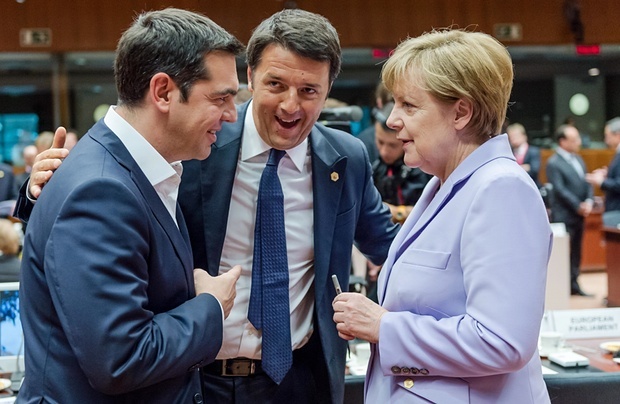 The gamble that the leaders of France and Italy would help Greece overcome the German right’s monetarist taboos. The gamble that other European peoples, overwhelmed by austerity policies, would pressure their governments into a Keynesian reorientation (Greece thought it was the torchbearer for this). The gamble that this change would be conceivable within the eurozone; noexit scenario had been envisaged or prepared. And the gamble that intermittent hints of a “Russian option” would, for geopolitical reasons, contain Germany’s temptation to punish Greece and encourage the US to stay Germany’s hand. At no point did any of these gambles seem likely to pay off. It’s not possible to hold off a tank with violets and a catapult. After a year, Poincaré had to raise taxes by 20% to fund his occupation, a cruel paradox for a rightwing leader opposed to taxation who had insisted Germany would pay. He lost the next election and his successor evacuated the Ruhr. No one has yet imagined such consequences in any of the countries that have crushed Greece to make it settle a debt that even the IMF admits is “totally non-viable”. Yet the Eurozone countries’ fixation on punishment has already obliged them to commit three times the sum (around €86bn) required had funds been released five months earlier; in the meantime the Greek economy had collapsed through lack of liquidity (5). So the price of German finance minister Wolfgang Schäuble’s inflexibility will be almost as high as Poincaré’s. But Greece’s humiliation will serve as an example for other potential offenders. (Spain, Italy, France?) It will be a reminder of the “Juncker theorem” formulated by the European Commission president, Jean-Claude Juncker, four days after the Greek left’s electoral victory: “There can be no democratic choice that is counter to European treaties” (6). One bed is too narrow to accommodate 19 different dreams. It was an almost imperial undertaking to impose the same currency on Austria and Cyprus, Luxembourg and Spain, on peoples who do not have a shared history, political culture or standard of living, the same alliances or languages. 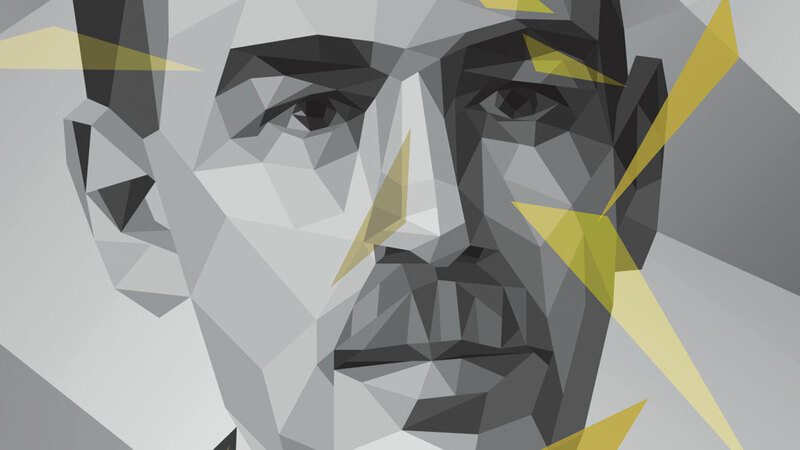 How can a state conceive an economic and social policy that is open to debate and democratic negotiation if all the mechanisms of monetary regulation are outside its control? How can peoples who may not even know each other accept a degree of solidarity comparable to the inhabitants of Florida and those of Montana? The whole thing rested on a hypothesis: that federalism at an accelerated pace would bring European peoples together. Yet 15 years after the creation of the euro, animosity has never been greater. So much so that, when Tsipras announced his referendum, he used language like a declaration of war — “a [Eurozone] proposition in the form of an ultimatum addressed to Greek democracy” — and accused some “partners” of seeking to “humiliate an entire people”. The Greeks massively backed their government and the Germans rallied behind the quite opposite demands of their government. Could their destinies be any more closely linked without risking domestic violence? 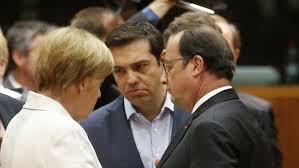 But the hostility is no longer just between Greece and Germany. “We do not want to be a German colony,” insisted Pablo Iglesias, leader of Podemos in Spain. Italy’s Prime Minister Matteo Renzi — whose reticence throughout has been noteworthy — let slip: “I say to Germany: that’s enough. Humiliating a European partner is unthinkable.” According to German sociologist Wolfgang Streeck, “in Mediterranean countries, and to some extent in France, Germany is more hated than at any time since 1945. … Economic and monetary union, which was supposed to consolidate European unity once and for all, now stands a good chance of shattering it” (7). The Greeks are attracting hostility, too. Junker is said to have told Tsipras: “If the Eurogzone functioned like a parliamentary democracy, you would already be out, because that is what nearly all your partners want” (8). Using a well-known conservative mechanism, now deployed at nation-state level, poor states have been encouraged in their mutual suspicion that others, like the proverbial “welfare chiselers” of Ronald Reagan’s speeches, are living at their expense. The Estonian education minister castigated Greece: “You’ve done too little, too slowly, and much less than Estonia. We have suffered much more than Greece. But we didn’t stop to complain; we just got on with it” (9). The Slovaks were aggrieved at the level of pensions in Greece, which should be “finally declared bankrupt in order to clear the atmosphere,” as the Czech Finance Minister kindly suggested (10). To left wing activists and trade unionists, stopping and thinking seems a better option. Even for those who fear that an exit from the euro would encourage the break-up of the European project and the revival of nationalisms, the Greek crisis demonstrates that a single currency stands against popular sovereignty. Far from containing the far right, such an obvious realisation encourages it, since the far right mocks its enemies’ lectures on democracy. 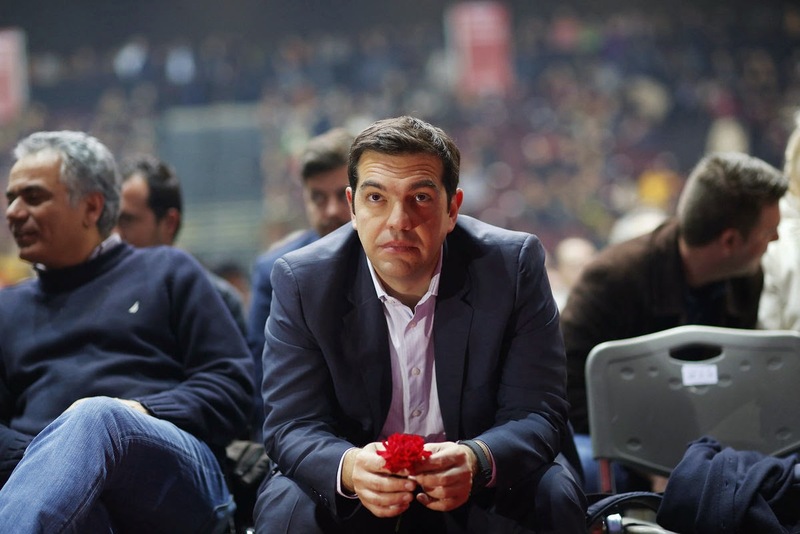 How can anyone imagine that the single currency could one day accommodate a progressive social policy, having seen the plans that the Eurozone states gave Tsipras to force this left wing Prime Minister to implement rigid neoliberalism? Posted in Democracy, Economic and Public Policy, European Union, Finance, Foreign Affairs, Governance, Greece, Greece Debt Crisis, Greece Debt Problem. EUROPE has been glued to the Grexit television screen for the longest time. Going on and on for at least five years, each episode of whether Greece will remain in the eurozone or not has run longer than the longest Tamil movie of yore (although we have our own MIC version, with 1MDB trying to play catch-up). What are the lessons for ASEAN of the EU’s Greek tragedy? No doubt the first thing that will trip out is: Thank God we do not have a common currency. However, this is only the tip of the iceberg. Beneath the surface there are deep issues involved, so many currents, cross-currents and counter-currents in the management of regional integration. I will highlight three of the more profound: fiscal discipline; national sovereignty; and community negotiation process. Fiscal discipline is actually easy to define, but so difficult to uphold when the freewheeling genie has been out of the bottle for so long with no inclination of coming back in. Under the EU’s Stability Growth Pact government deficit has to be not more than 3% of GDP and debt 60%, something characterised more in the violation than the adherence. Nothing has been done about this for years. In the case of Greece over the last five years they were supposed to be brought down, but the numbers for the fiscal deficit went up again and the country is up to its ears in debt, coming to 200% of GDP after averaging an already unsustainable 177%. The other side of the austerity equation is unemployment which has hit 25.6%. (Unemployment in Indonesia as a result of the 1997-98 Asian Financial Crisis was 30%; lowest European unemployment is in Germany at 4.7%). Youth unemployment in Greece stands at 60%. The Greek economy has shrunk by 25% since the first IMF aid package in 2010. The government and people are saying they cannot take any more, but the creditors – on whom the Greeks are dependent for more bailout and interest servicing packages like an opiate – are saying not enough has been done in a sustained fashion to bring debt and the deficit down. The Greeks have been used to many things which the creditors now insist on taking away from them. You cannot live beyond your means forever. The chicken is coming home to roost. From the seven main points of the agreement reached on the night of July 13 for a new bailout package of 86 billion euros, it is clear Greece is now being pushed right against the wall – including what many in the country declare to be violation of its sovereignty. While certain requirements such as cutting pension spending and increasing revenue, through seamless imposition of the top VAT rate of 23% for instance, might be considered par for the course in these bailout situations, the insistence on the transfer of up to 50 billion euros of “valuable Greek assets” to a new independently managed fund, as a form of collateral, was felt by Greeks to be rubbing their noses in the dirt. Sovereignty, what sovereignty? If Greece wants to remain in the euro and needs all the bailout money, including money to service existing bailout funds, has the country got any alternative? The Greek Prime Minister may quote Paul Krugman on the pain and damage all the austerity requirements are causing the economy, or even appeal to a European sense of history by comparing them to the punitive terms of the Peace of Versailles in 1919 (which historians assert were the root cause of the Second World War as Germany struck back to wipe off the shame), but has he got any other option? If you need the money, what can you do? South-East Asians may remember that picture in 1998 of the then IMF Managing Director Michel Camdessus standing over the cowed former Indonesian President Suharto, as he signed away Indonesian macroeconomic sovereignty. From profligacy, it might be said, to loss of an important part of national sovereignty. In the negotiation of the new Greek bailout deal this month – which still may undergo many twists and turns – a feature has been the predominance of Germany in the EU and in the eurozone (comprising 19 of the 28 members of the EU). It is after all the largest creditor nation and economy. If pretence was set aside, it is also the most powerful country in Europe (which arrangements at the end of the Second World War were intended to avoid – but that is a different story). Every member country has a veto of course, but in negotiating the outline and details of the rescue package for Greece, Germany has led the way all this while and its commitment is indispensable, however much the French try to give the impression of having an eminent role as well. So, how do we look at it all from an ASEAN perspective? The first instinct – thank God we do not have a single currency – is of course to be expected. But the thinking on what has been happening in Europe and on how relevant it is to AASEAN should not end there. We do have big states and small states. We may say our negotiating and decision-making processes are different – and national sovereignty is untouchable. But this is too pat and shallow. The process of community-building is moving ahead. The voice of bigger countries does carry greater weight. However if it is in the service of what is good for the larger whole, there is not much to be afraid of. The changeable predispositions of member states, however, have to be managed. Indeed, what a significant member state DOES NOT DO also affects ASEAN – as is the case now with the growing uncomfortable feeling that Indonesia under President Jokowi is not so enamoured of the regional grouping. Indonesia therefore is critical to ASEAN. What and how it thinks, what happens in that country, have Asean impact. Thus engagement, with Indonesia particularly but also among all member countries, is most important. ASEAN needs, at this stage of its development, to have a Minister for ASEAN Affairs in each member country. The prospects and challenges need to be a focus in every national administration. With respect to economic management, while there is no single currency, there are threats to ALL ASEAN economies of mismanagement in ONE, especially a significant economy. Contagion is always a risk. With increased intra-regional trade (although now only a quarter of the total trade), there will be knock-on effects across the region. 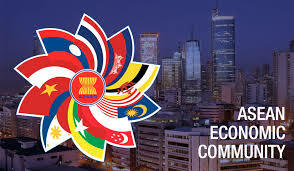 Importantly – let us not forget – we are talking of ASEAN as a region, one single economy, with the prospect of the most promising growth in consumer demand and economic size (coming up to 4th in the world by 2050). ASEAN is an asset class. With the herd instincts of markets, reverse flows caused by fear of contagion can quickly develop into a regional crisis. While global arrangements such as with the IMF remain, let us also not forget we have an untested multilateral currency swap system that includes three East Asian partner countries to address potential and actual balance of payments and short-term liquidity difficulties – the Chiang Mai Initiative Multilateralisation (CMIM). The US$240bil fund is 20% Asean and 80% China, Japan and South Korea. The commitments from each country are really promissory notes, and a country in difficulty can draw up to 2.5 times its committed amount. Will the support always be forthcoming? Will political differences not get in the way? Not to mention an assessment of whether the country facing difficulty has exercised fiscal discipline in the management of its economy. The CMIM has an institution, AMRO (ASEAN+3 Macroeconomic Research Office), to monitor and analyse regional economies in support of its decision-making process. The central bank governors deciding on requests for support will also rely on AMRO reports and input, and there could be conditions attached to such support, whether the 6-month Breaking Line or the One-year Stability Facility. There could be expectation, frustration, anger and discord. There are therefore nascent possibilities and challenges which should concentrate ASEAN minds as they consider the Greek drama in the EU’s eurozone beyond “Thank God, we do not have a single currency, and never should have.” We cannot be immunised from the unintended and unanticipated consequences of community-building. We have to have the institutions and imagination to manage them. 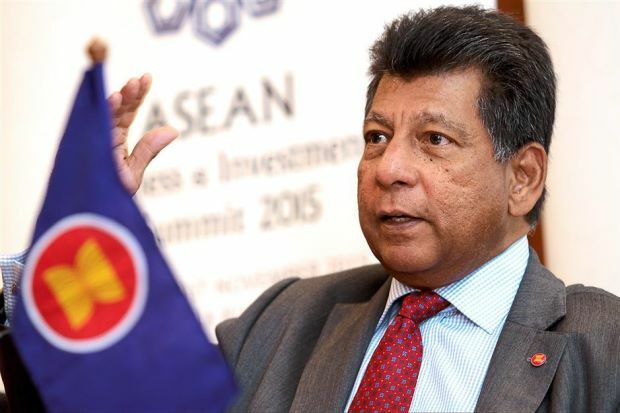 Tan Sri Dr. Munir Majid, Chairman of Bank Muamalat and Visiting Senior Fellow at LSE Ideas (Centre for International Affairs, Diplomacy and Strategy), is also chairman of CIMB ASEAN Research Institute. Posted in 1MDB Financial Scandal, ASEAN, Economic and Public Policy, Economics, Finance, Foreign Policy, Geo-Politics, Governance, Greece Debt Crisis, Najib Razak, Public Accountability, Regionalism, The Eurozone. “NEITHER a borrower nor a lender be.” This famous quote in the play Hamlet makes Shakespeare as relevant as ever. Of course, it is quite inconceivable how the modern economy could operate without companies getting loans from banks and investors. But it has also become clear that the mountains of debt owed by families, companies and governments threaten not only to derail but also swallow up whole economies. The bad management of debt, whether by those who borrow or those who lend, can cause societies to be throttled by recession, job losses and social chaos for years on end. “In the worst cases, indebted countries can lose their sovereignty and have their policies subjected to the demands and fancies of creditors, who may have no hesitation to dominate and humiliate those they lent to and who could not repay. This surely is a major lesson from the current tragedy of Greece that continues to be played on our TV screens and in daily news reports. After years of austerity policies imposed by its creditors, the situation deteriorated rather than improved. The economy’s output had dropped 25%; the unemployment rate had shot to over 30%; poverty is rampant; and many families can no longer afford health care. Early this year, the people voted in a party that advocated an anti-austerity programme. Five months of negotiations with its creditors (European countries, the European Central Bank and the International Monetary Fund) did not yield any positive results. Instead, there was increasing acrimony between both sides. The Greek banks began to run out of cash when the European Central Bank stopped the flow of new cash to them. Since Greece does not have its own currency, it depends on the ECB for the supply of euros. When the banks were thus forced to close, and each person was limited to withdraw only €60 daily from ATM machines, there was high pressure on the radical Greek government to give in. Though he won a vote of ‘no to the austerity demands’ in a referendum, within a few days Prime Minister Alexis Tsipras had to swallow his pride and negotiate with the other European leaders to get new bailout funds. His government could have opted for “Grexit”, to leave the Eurozone and go back to issuing its own currency and thus regaining control over its monetary independence and economic policies.But most of the public wanted to stay with the euro, and reverting to its own currency also comes with risks. Thus, the Greek Premier’s main aim was to stay in the eurozone, and the price was to accept the demands of the hard-liners among the other European countries, especially Germany. In return for €86bil (RM354bil) of new bailout funds, he had to agree to an even tougher policy package than offered by the same creditors a week ago. Much of the new funds will go to repaying existing debt and thus will not be used to revive economic growth. Instead, growth prospects will be undermined by new austerity measures such as a rise in value-added tax and pension cuts. Proceeds from privatisation of state assets up to €50bil (RM206bil) are to be put in a fund to repay debts and recapitalise banks and will be managed by creditors, who will also supervise the implementation of agreed policies.The Greek Premier and his Finance Minister protested for most of the all-night July 12 summit of European leaders, but eventually caved in on almost all points. 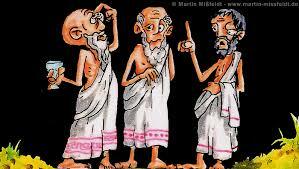 The Greek leaders had been ready to adopt the new austerity measures, in exchange for debt relief. Instead, they had to accept even more stringent austerity and privatisation policies and did not get debt relief or even debt restructuring due to the objections of Germany and others. The IMF, one of the creditor institutions, has now shocked the public by releasing the memo it had presented to the European leaders during the weekend of the fateful 12 July summit. The memo estimated that Greece’s debt would go up to 200% of its economic output in the next two years, well above the 127% at the start of the European crisis. This implies a worsening of Greece’s financial situation despite the austerity policies it has to endure, and shows the policies are inappropriate. These are the same points that the Greek leaders had been arguing, but unsuccessfully. The European leaders also ignored IMF advice. For years the rich countries have imposed the same austerity measures on indebted developing countries, which depressed their economies and got many of them deeper into debt. After decades, when it was clear the debts could not be repaid, debt relief was finally given to some 20 highly indebted developing countries, but their people had already suffered and their economies still did not fully recover. It is now the turn of Greece to learn the lesson that creditors can be and usually are cruel almost beyond belief.The Greek tragedy is still being played out. The drama continues. The people of Greece are very frustrated and angry. Nobody knows what the ending will be. Martin Khor (director@southcen tre.org) is Executive Director of the South Centre. The views expressed here are entirely his own. 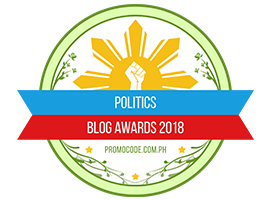 Posted in Economic and Public Policy, Economics, Financial Scandal, Governance, Greece Debt Crisis, Greece Debt Problem, Internationl Affairs, Kleptocracy, Leadership, Macroeconomics, Najib Razak, Politics, Public Accountability, Public Policy. If you are a normal citizen and you owe the bank, you do not go around accusing the bank of being a Nazi for setting conditions on you. Of course your creditors will set their terms and conditions to get some of their money back. Are the terms and conditions suffocating? Of course, compared to the freedom you had before you started owing money and your creditors know you are bankrupt and have no intention of reforming your ways. Greece’s problems started in 1984 when it started massive economic expansion, then they cooked the books in 2001 (thanks to Goldman Sachs) to get into the Eurozone. Everyone knows but no one dared to challenge Greece. To do that, you will be sticking your head out and accused of being “unEuropean”. As a German, it will not do you any good on the world stage to keep your head down or stand accused of being a Nazi (still happening in the UK whenever UK does not agree with Germany. By the way, Waterloo would not have been won without the Prussians’ aid. The Greek crisis is due to massive tax evasion, irresponsible public spending and corruption. From 2001, Greece’s “GDP per capita nearly tripled, from $12,400 in 2001 to $31,700 in 2008” (World Bank Data). Public spending soared and public sector wages doubled while benefits rose. Greece was living like a first world economy when it is actually has a third world economy. In 2004, Greece spent USD 11 billion for the Olympics. Money they do not have. Greek taxpayers were on the hook for €7 billion, which did not include the cost of extra projects such as a new airport and metro system. Greece is also infamous for tax evasion.http://www.wsj.com/articles/greece-struggles-to-get-citizens-to-pay-their-taxes-1424867495 Tax debts in Greece equal about 90% of annual tax revenue, the highest shortfall among industrialized nations, according to the Organization for Economic Cooperation and Development. Shipping magnates do not pay tax. Somehow, this is enshrined in their constitution. Strangely they have tax collectors who physically collect taxes from small businesses. High level of bribery means the government hardly get to see any taxes. Businesses are often done in cash and tax evasion is made easier. In Greece, their pension system is highly complex. There are 580 occupations that have special privileges allowing for early retirement, for example, a hairdresser, because he uses chemical to dye hair, can retire at the age of 45. A civil servant’s spouse and unmarried daughter (irrespective of age) can inherit his/her pension which is 90% based on last 5 year’s salary. In Germany, we have to work 45 years or until the age of 67 to be able to retire with full pension based on all our years of working life and only 60% of net average. Spouse receive 60% on the demise of the pensioner. If he has his own pension, deductions are made. Children do not inherit their parents pension’s. Until the crisis hit in 2008 and the EU came in to question, the Greek government did not know how many civil servants they have on the payroll, and their monthly expenses. Answer: 768 544 recorded staff for a country of 11 million. Sixty percent of Greece’s civil servants apparently do not know how to use the computer. Until today, Greece do not have a complete land registry so no taxes on a lot of home owners. Eighty seven percent of Greeks have homes (even 2nd homes) compared to 53% in Germany. According to Transparency International Greece’s National Integrity Assessment 2012, the problem of corruption in Greece is the confluence of many factors, including a weak enforcement of the law, a lack of audits, the absence of codes of conduct, the non-transparency of government activities, an inefficient bureaucracy, government impunity and broad discretionary powers and a lack of public awareness. Since the crisis and the injections of money from the Eurozone, notably Germany with 68 billion Euro, there has been no change to Greece’s structural reform despite promises after promises upon receiving the bailout. Everyone has good reason not to trust the Greek government to initiate any reform based on past 7 year’s experience and the new government. (As a side: Tsipras and Varoufakis upset the punctual Germans when the Greeks arrived 45 mins late for a meeting that was called up again and again in Brussels to help solve Greece’s problems. Both of the Finance Ministers of Greece came twice without any proposals but lots of rhetoric and presentations. Varoufakis thinks he is a great economic lecturer who had to teach the other “stupid” Finance Ministers a thing or two about economics by lecturing them instead of concentrating on a good proposal for Greece.). What sovereignty can you demand if you are bankrupt and depend on your creditors to help you? Why is your country in worse shape after 6 months of your rule if you are capable of turning your country? Why have you done nothing good for your country the past 6 months? As a proud nation, start paying taxes, stop asking for more money from your creditors but help yourself instead if you are humiliated and asphyxiated by them. Creditors may make mistake but it is to their detriment if their debtors come out worse because of their action as then they will not be able to recoup their losses. Germany is certainly not unreasonable in its demands to Greece. Germany does not want a Grexit but Germans must also think about their own future. We could certainly use the Euro 68 billion ourselves. Our autobahn, schools, bridges etc. are falling apart in our drive for austerity. Our salary has been kept back the past 15 years so we can compete globally. We have suffered and we are not happy to give our money to others who are not willing to be as frugal and willing to accept pain to succeed as we have..
Take home pay for ordinary citizens in Germany after various taxes (health insurance, solidarity tax to help former East Germany, health care insurance etc. ) is about 60% of gross pay and we have VAT on goods and services too, even tax on profits we made from our after tax savings above a certain amount. The Eurozone is not a transfer union that is we should not have to prop up weak countries financially. As such, Merkel and Schäuble have to be very careful what they can do after so many of the Maastricht agreements have been bent to breaking point to save Greece. 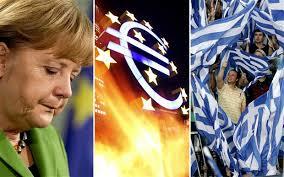 The Eurozone consists of 19 countries but Germany is the paymaster and yet abused. Is this reasonable? Greece could sell its gold to finance itself but it prefers to use other people’s money rather than its own sweat and money (assets). Its time Greek government tells its people the truth and stop the propaganda blaming other for their situation. It is time for the Greek people to face the truth. Greece is not the only democracy in the Eurozone. It may be the oldest but its contribution to the world was 2,000 years ago. Nobody owes the Greeks for their living. We Germans work hard and live frugally. If we were to have a referendum in our respective countries,citizens will vote for “NO” to further financial assistance to Greece. We may be sympathetic to the poor Greeks,and are willing to help from citizen to citizen on a voluntary basis. Someone calculated that each citizen in the Eurozone now has a debt of Euro 47,000 on our loan to Greece forced on us by our government . Yes, the banks should bear their losses but not our expense.They took their profits but, why must be left holding their losses. Germans are not against ordinary Greeks. We feel for them and we are the biggest contributor in sending assistance to Greece but we want the Greeks to help themselves and show some appreciation, not to condemn us for the sins of our grandparents. Posted in Corruption, Economic and Public Policy, Governance, Greece Debt Crisis, Public Accountability, The Eurozone.